This ride will replace the Berry Go Round that we’ve had on our shows since October of 2013. A big thank you to Mike & Connie Featherston of Gold Star Fabrication of Faribault, Minnesota. All components manufactured right here in the great USA! We are constantly upgrading our equipment line up. 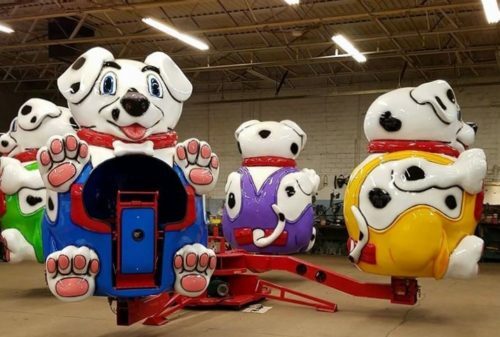 Watch for the brand new Pound Puppies aka the Puppy Roll on an SVR midway starting in March! The ride will be complete with a voice repeater control box where the ride attendant can push various buttons that say the rules in both English and Spanish with a bit of entertainment in between. Each of the cars also come with an interior solar powered light to help ensure your safety on and off the ride during the evening hours.